Friday, September 24, 1982—got gear ready by early afternoon to go to Delta to hunt Sandhill Cranes and hopefully some geese. Drove up to Glennallen and stayed at Darrel’s in the evening. I’m tired tonight, brought Mike, our dog along. Saturday, September 25, 1982—Charlie, Darrel and I cleaned a bunch of salmon and split them for drying. Darrel and I drove to Delta to hunt on Barney and Scott Hollemback’s farm—camped in my tent. 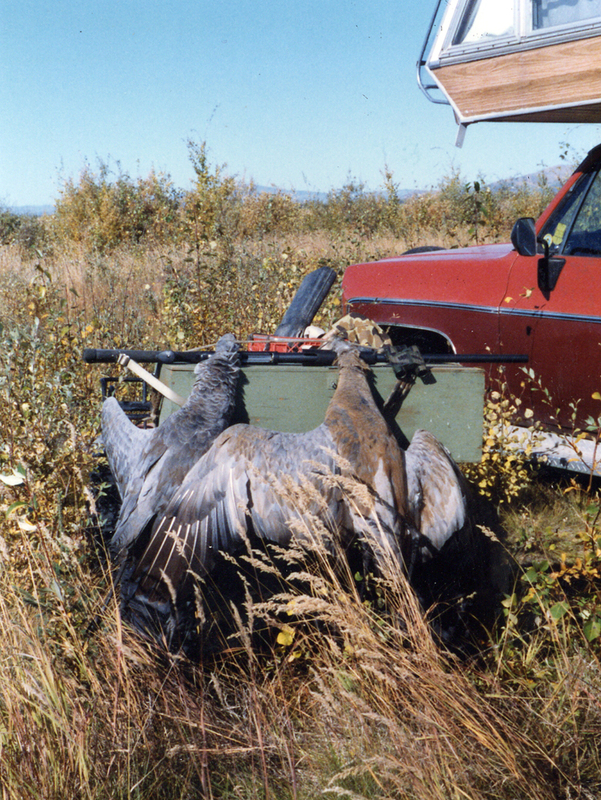 Sunday, September 26, 1982—got up early, we’re up at Delta hunting Sandhill Cranes. Scott, the farmer, is hunting with us. The cranes were really flying high today. I only shot one and hit another one hard with bb shot. Scott got one. We had a good time here today hunting, lots of fun. Monday, September 27, 1982—up early. One flock of cranes flew almost in range. Then later we tried to stalk some but that didn’t work. They spotted us and flew. I bought some hay from Scott and Barney for Hoffman’s goats and left Delta early afternoon. Got home at 8:30 p.m.
Tuesday, September 28, 1982—dropped six bales of hay off at Hoffman’s place, visited Dan and Patti, Blake and Jackie a few minutes. Built a lean-to on brown trailer. Put away lots of things for winter to make things neater and look better around the cabin. It’s cloudy, cool and a little snow and was 20° this morning. Wednesday, September 29, 1982—snowed all day, warm. Sharpened some knife blades. Loaded a wrecker and pump truck on a lowboy trailer for some people. Winched this equipment on the trailer with the swamp buggy. This entry was posted in Journal Entry and tagged Delta, sandhill cranes. Bookmark the permalink.